Are ANZACs. 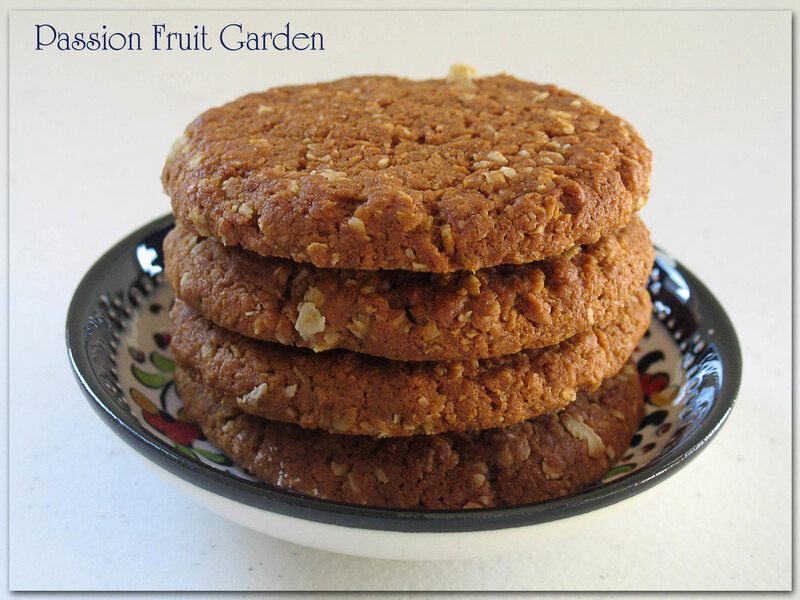 ANZACs are a significant biscuit in the Australian psyche. It became a practice during WWI for the family of soldiers to make this simple biscuit for their loved ones serving in the conflict. The biscuits are so sturdy they were able to withstand the three month sea voyage from Australia to Europe to arrive at the battle field in one piece. These days, many add all sorts of yummy things to their ANZACs but I like to stick to the original recipe as a token of respect to their origins. My ANZACs are sitting in a little Turkish dish, a nod to all those young men who perished in Gallipoli 100 years ago. Are cherry tomatoes. Don’t laugh – if you look closely, you may be able to make out a happy face. Clearly, tomato art is not for me 🙂 This year, I was determined not to have any cherry tomatoes because of the back log of tomato puree I have in my pantry but .. I was not quick enough. One day, I found God knows how many plants tangled up with the other plants in my vegie patch. It was too late. I was a goner. As it turns out, I am not so sorry they appeared. The ‘Romas’ that I planted turned out to be San Marzano which are not very nice in salads so the cherry tomatoes are coming in handy. In an effort to use as many cherry tomatoes as possible, I have taken to roasting them. They taste great. On this day, Maus made some potato cakes (which were all right but nothing special) and I topped them with roasted cherry tomatoes. 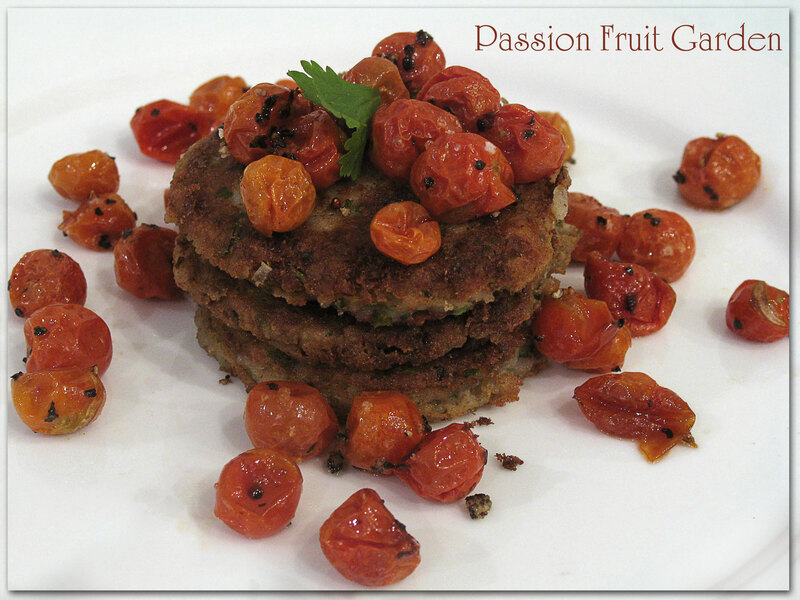 The cherry tomatoes really lifted the potato cakes. Are dried tomatoes. As I am determined not to preserve any tomatoes or make tomato puree this year, I am drying a lot. 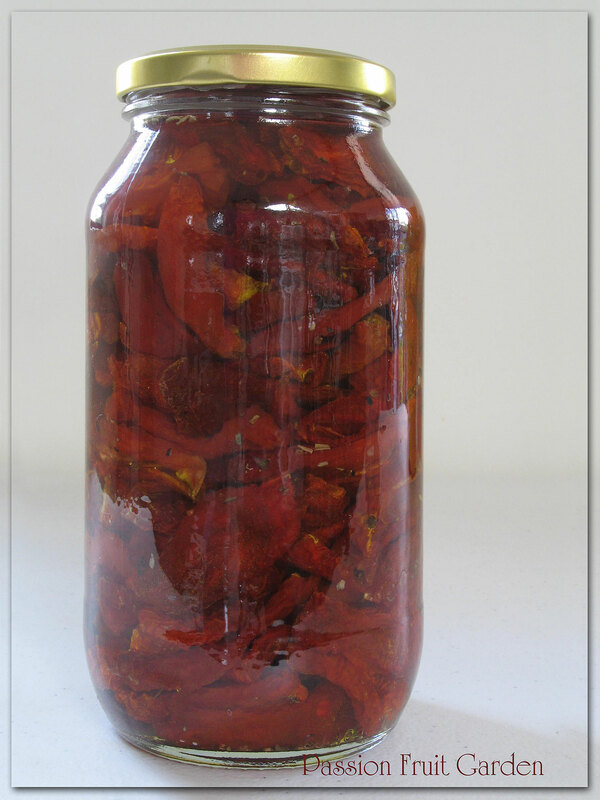 It is a great way to transfer kilos of tomatoes into one jar. This is one of quite a few jars. I am also slow-roasting and freezing them. Are olives. This year has been a good year for olives. The birds have left most (well, some) of them for us. This is a picture of our early ripening olives: Arbequina, Frantoio, Mission (WA) and a few UC13A6s (Californian Queen), the large dark ones in the central front box. UC13A6s are table olives but as we have so many pickled olives already, they went off to the olive press with all their oil variety mates. This is about 120 kilograms. We still have to pick the Kalamatas, Manzanillo and Verdales which we are hoping will yield us another 100 kilograms. We should be right for oil for a while. 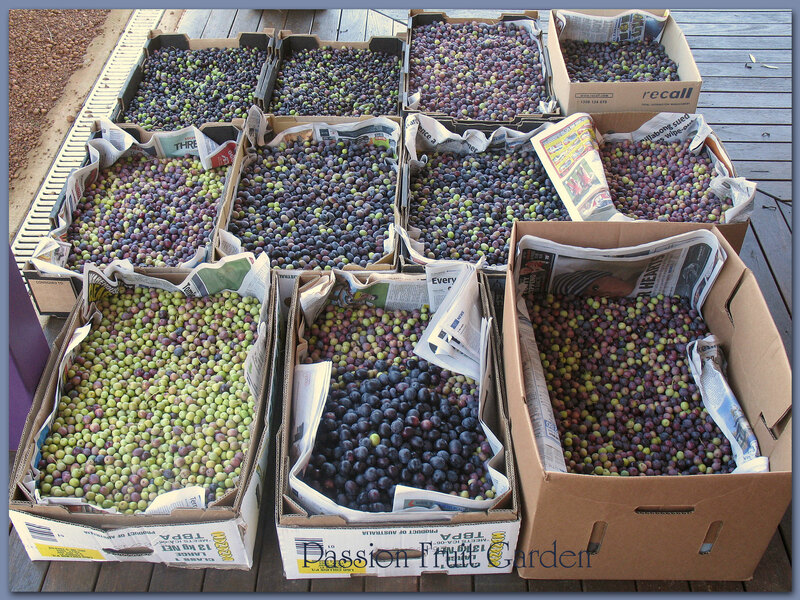 If you are interested in the different olive varieties, you may like to check out my old post, Olive Varieties in Perth. It sports lots of close-up shots of each variety. 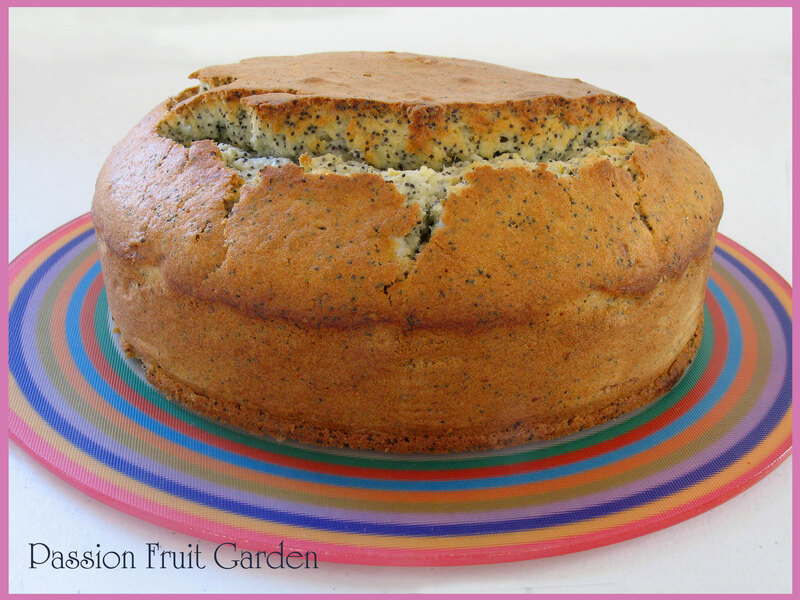 Is a lemon and poppy seed cake. Have you ever wondered why you do not see many cakes on this blog? Well, now you know! As you can see, I am no cake maker. I have absolutely no idea why this happened. If you are a cake maker and know, please, tell me. If I don’t know what I am doing wrong, it is hard to improve. In any event, the cake tasted great. It was a Maggie Beer recipe from Maggie’s Table. I was attracted to the recipe as it had 8 egg whites in it and I love using egg whites from my collection in the freezer. Is the said cake, iced. It doesn’t look much better, does it? I filled in the crack with the icing so that part is improved but the icing was horrid. 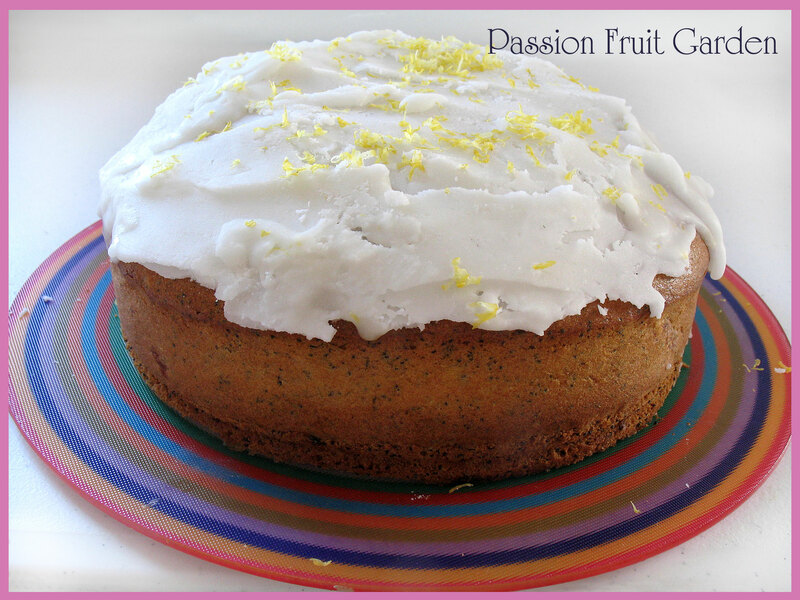 Maggie Beer said to melt some icing sugar and lemon juice and pour it over the cake. Mine never went runny so I tried to slather it over. What a mess! After our guest left, I scraped off the icing, added some butter and put it back on. It still looked a mess but Maus was happy. She doesn’t mind a bit of cake with her icing. Is my dismal bounty from my Melbourne trip. I know what many of you who have seen my posts after other trips are thinking. What the hell?! Only three items!!! But … our kitchens are full and Melbourne doesn’t seem to have a Peters of Kensington equivalent. We went to Chef’s Hat, London & American Supply, Unicorn Kitchenware and Chefland. We liked Chef’s Hat the best but were still able to resist their wares. My favourite item is the preserving funnel. 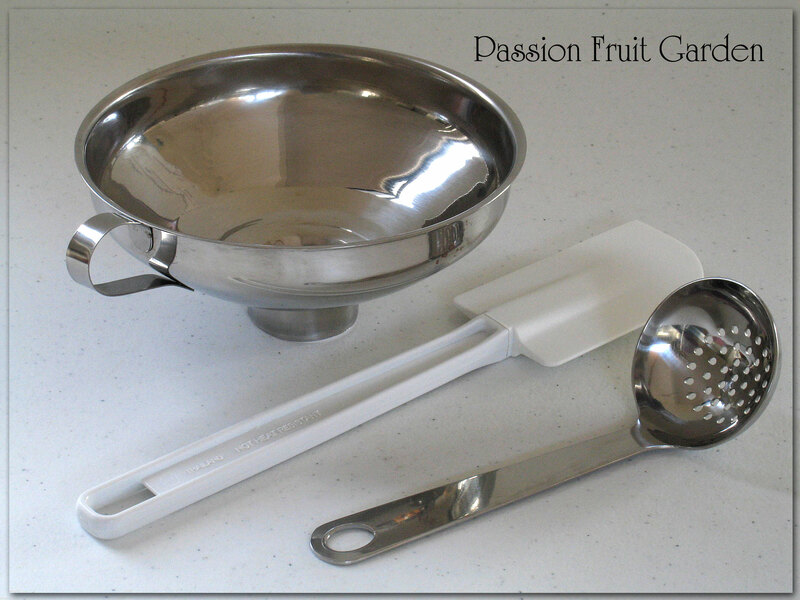 The spout is too big on one I already had – you can only use it on large jars. I like to use small jars as there are only two of us and I don’t like open jars lurking in the fridge for months. I have already used it twice, whereas I have never used my original one. The scraper cost $2.50. I thought I would try it out because I am always buying scrapers. They just don’t seem to last in our house. 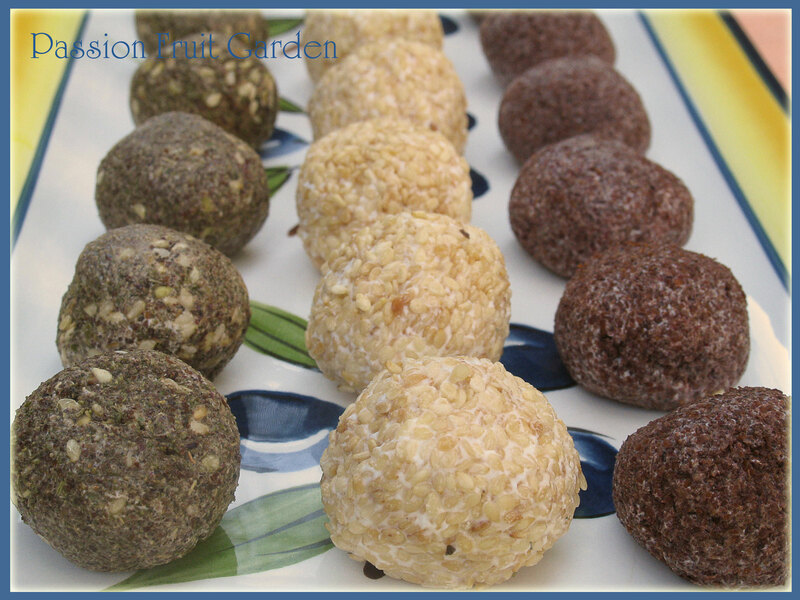 My favourites are by Kuhn Rikon but they are pretty expensive, get destroyed just as quickly as the cheap ones and, in any event, we are having trouble sourcing them. The $2.50 scraper is doing just fine. It is not heat proof so Maus is sure to melt it before long but it is nice and flexible and gets into all the nooks and crannies. Maus picked up the mini ladle. It is proving useful scooping pickles out of jars. Are my two funnels. The new one is on the left. If you are looking to buy one, really check out the size of the opening. 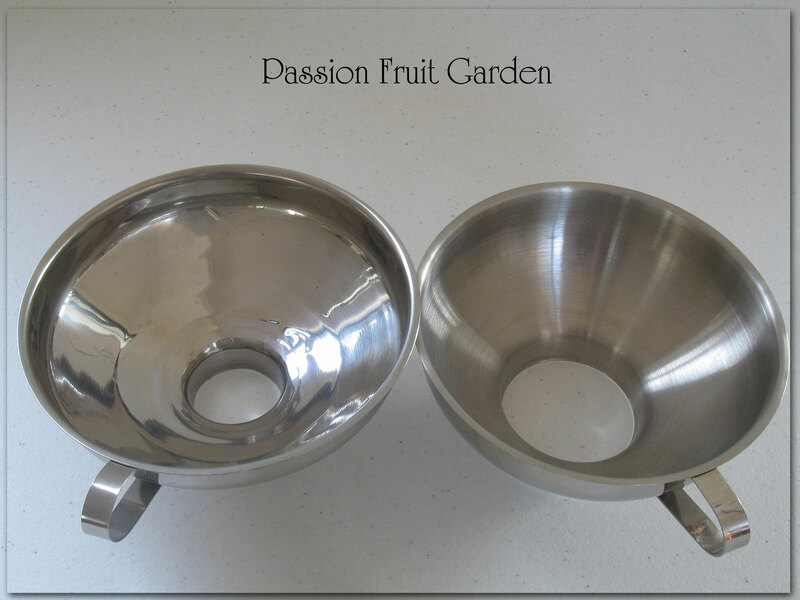 The opening on the funnel on the right is only useful for wide mouthed jars or one litre jars, whereas the one on the left can be used for small jars which are perfect for chutneys, jams, etc. Are some new books. Luckily, my book shelves are not full and, if push came to shove and they were full, there are plenty of books I would throw out to fit another cook book in. There are some great bookshops in Melbourne. I particularly like Books for Cooks in Gertrude Street, Fitzroy, and Readings in Lygon Street, Carlton. 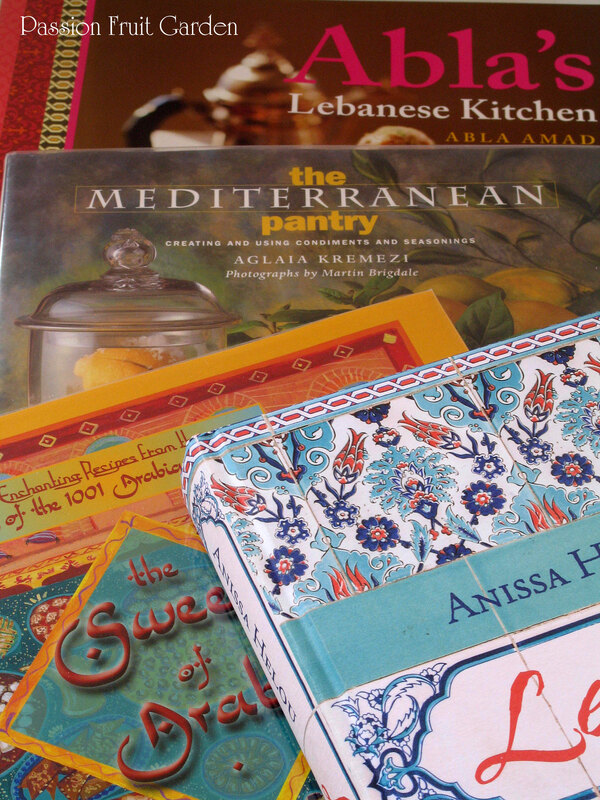 I bought The Mediterranean Pantry by Aglaia Kremezi, The Sweets of Araby by Leila Salloum Elias and Muna Salloum from Books for Cooks and Levant by Anissa Hellou from Readings. Is there a theme happening here? I also bought Abla’s Kitchen by Abla Amad. Maus became aware of Abla and her restaurant after Abla won the Order of Australia for significant service to tourism, hospitality and the Australian Lebanese community. Abla’s restaurant was one of the earliest Lebanese restaurants in Melbourne. 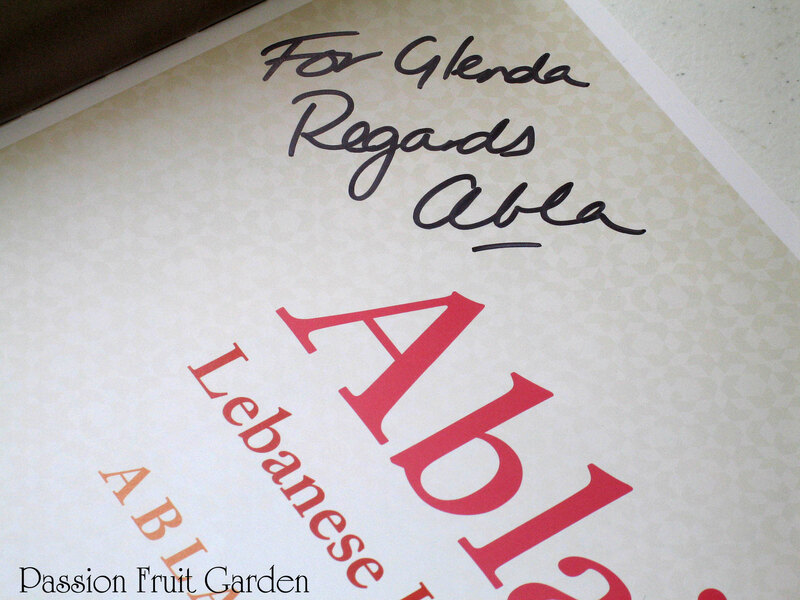 Abla published her cookbook in 2010. I had been aware of Abla’s cookbook for some time but never bought it as I have more than sufficient Lebanese cookbooks. But Maus arranged for Abla to sign a copy for me!! How lovely is that? She knows I love signed cookbooks. Abla even came to our table while we were dining and had a chat with us. Very cool. The restaurant, BTW, sells pretty standard Lebanese fare. Were some labne balls. We bought the labne (I know, I know, but we were pressed for time) from Perth Lebanese Bakery in President Street, Kewdale, and rolled them in (from left to right) za’atar, sesame seeds and sumac. They were very nice as a starter. 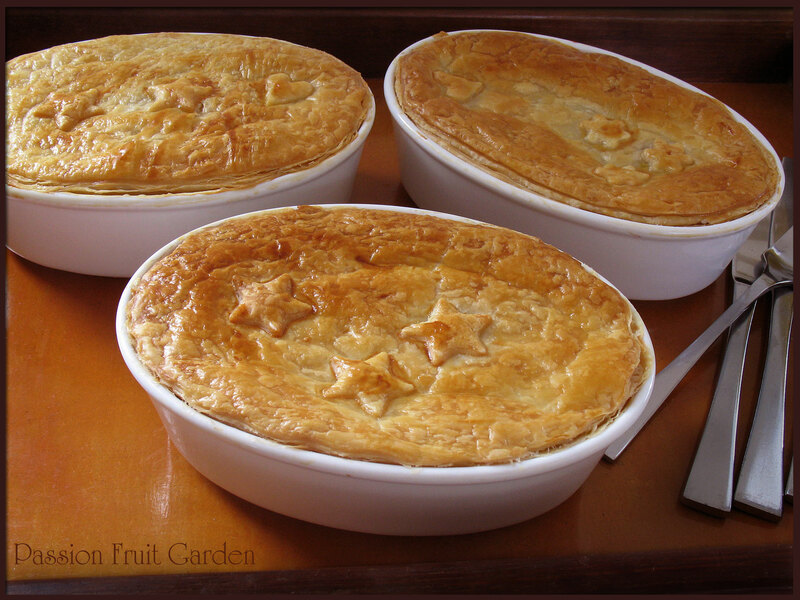 Were some chicken, bacon and leek pies. I would have done a post on them as they were delicious but we had a guest who had never been to our place before and I was too embarrassed to ask her to wait for her lunch whilst I took a close-up shot of the filling. I managed this snap shot on the way to the table. This entry was posted in In My Kitchen and tagged ANZAC biscuits, Books for Cooks, Labne balls, Olive varieties, Preserving funnels, Roasted cherry tomatoes, Sun-dried Tomatoes by Glenda. Bookmark the permalink. I love that funnel. I am going to have to try and find one. Mine has a similar opening to your larger one. I can just use it in smaller jars by positioning it carefully on the jar top 🙂 So jealous of your olive harvest, and your soon-to-be olive oil. I can’t believe you are still getting tomatoes. All our died ages ago. What an olive haul, wow! Love the cherry tomatoes. I always have several different cherry tomato plants as I love them in salads, or for that matter the boys and I just nibble on them straight from the garden. As long as your cake still tasted good, looks don’t matter! Hi Gretchen, Lucky looks don’t matter otherwise I would be in real trouble 🙂 That is one ugly cake. Nothing more satisfying than a new pile of cookery books to explore, I say! I Kavey, you are a woman of my own heart :). Glenda. your cake is risen and looks very well cooked and lovely. best bakeries have cracked cakes.. this is what makes them “homely”. Would love to taste it ! Lara, you are toooo kind. I am no cake maker. Interesting history there. they look delicious by the way.. my kind of biscuits. Lara, they are very traditional in Australia. oh yes those pies look so delish and what a huge amount of olives! we have one tree which is 25 years old and has fruited twice only. i actually got about 900g of olives this year! love the funnel it is always so hard getting hot preserves into little jars isn’t it? great post! Hi Sherry. The funnel was a great find. 900g!!! That is not much. What are you doing to that tree?? 🙂 We picked about 80kgs from 2 trees today and expect to get the same amount from another tree tomorrow. Arh, you are so right, they like it hot and dry. Glenda, your cherry tomato “smiley face” made me smile. So did your olive crop. I also like your new preserving funnel — no dribbles down the sides of the jars! Perfect size. Thanks Kim, that funnel was a great find. What an amazing amount of fresh olives Glenda and having your own pressed oil… wonderful. It took me a bit to find the smile among the tomatoes, but I did. I am sure Maus potato cakes were delicious maybe more than all right 🙂 Anzac biscuits look and chicken pie… it’s all good in your kitchen. Regarding the cake, maybe the cake mixture needs a bigger tin or the baking temperature is high. With baking, sometimes it’s trial and error. Hiya Moya, The consensus is: the oven temp was too high. Back to the drawing board. Hi Celia, I remembered that you had Abla’s cookbook. If I remember rightly, you like it too. We should bet about 40 litres of oil – love it!! Ahh, so the oven was too hot. I got it!! My cakes always crack on top too – have you noticed there aren’t many cakes on my blog either 🙂 Loving your haul of olives and tomatoes – and the smiley face. Hi Nancy, I know it is just practice but there is such a thing as too much cake. Hi Ani, Thanks for stopping by and commenting. Glenda, those labne balls sure look tasty. I bet they’d be just as good as a finisher to a meal too? Would they work on a cheese platter with crackers and grapes? i found the tomato smiley face! Only took me 4 seconds – so do I win a prize? I am in awe of all those olives. That’s quite an impressive haul. Nice find on the funnel & I can see where the wide mouthed one wouldn’t be quite as practical and it sounds like you’re making good use of it already. But what a surprise it was to see that you’d found some more cook books. Now I’m not going to pretend to be a baker either but one thing I picked up in a cake baking class long ago was that cakes can split because of air bubbles in the batter. The way to get rid of them is to pour the batter in the pan, then smack it (not so hard that the batter blows up & out) and you’ll start to see these little air pockets on the surface of the cake batter. Just keep smacking the pan straight down on the counter a few time and it may help. If it doesn’t work at least you get a little aggression out of your system. Hi Diane, I will give that a go. It looks like Mount Vesuvius at the moment. I’d say it adds interest. I mean cakes can look boring but you’ve created a work of art. I’ll bet it tasted good though – right? OH my God what an amount of olives!! Love your pies with stars! Hi Ale That cake is too real for words 🙂 Thanks for stopping by. As always Glenda, wonderful IMK Post. I had to giggle when I saw your olives, we have exactly 1 olive on our tree. Have a wonderful and happy weekend ahead. I can see the tomato face, cute! We also had a lot of Anzac action at our house, they are good all year round I think. I look forward to seeing what you make from those gorgeous looking cookbooks too. Hi Vicki, Thanks for stopping by. ANZAC biscuits are a must on the day. Yours look delish. And I don’t like mine tampered with either. Good, old fashioned is the only way to go. Hi Jennifer, I agree, it beats the purpose of the biscuit if you add lots of expensive, perishable ingredients. Wow and I could not get my eyes off the ANZAC biscuits, but when I got to the tomatoes and olives…almost did make my way until the end! Your posts are always so warm and welcoming Glenda and thanks for this month’s IMK view too! 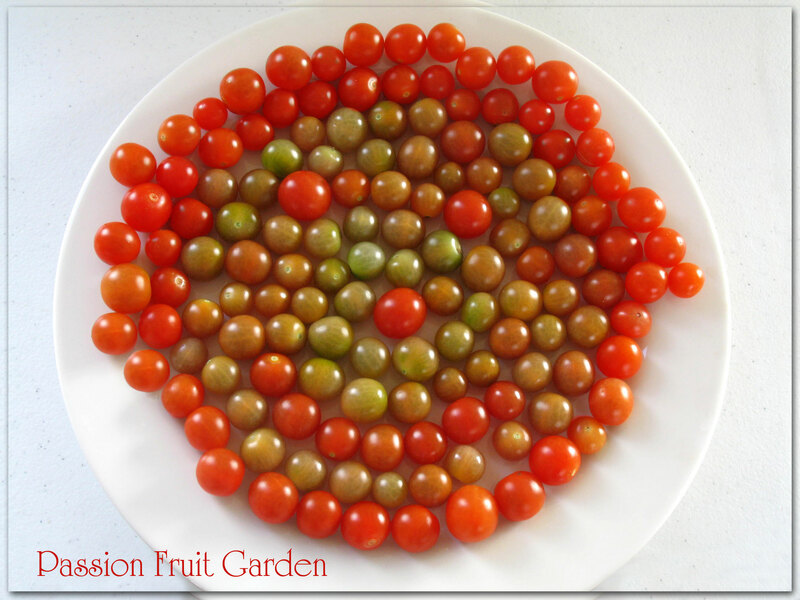 Your plate of tomatoes looks like something you look at during an eyesight test – what can you see in this picture? What a haul of olives; how fab. My advice about the cake is: you’ve found the answer. Icing. Amazing olive crop, really incredible and more to come. So you press your olive oil too? do you sell it commercially? The cook books look rather tempting too. Hi Francesca, No we don’t sell the oil, we use it, give it to friends and family and I make soap with it. The Abla’s Kitchen cookbook stood out for me. Many years ago before cooking shows were fashionable I discovered Abla via A Food Lover’s Guide to Australia. Of course on a subsequent visit to Melbourne I had to dine there. I’ve been back once again, love that it’s unchanged and both times got to chat to Abla. I love the simple but delicious Lebanese food. I saw that earlier this year “As part of this year’s Australia Day honours, Ms Amad has been appointed a Member of the Order of Australia for significant service to tourism, hospitality, and the Australian Lebanese community.” A wonderful accomplishment. Hi Ella, Maus gets my icing too. Hi Sandra, it is so hard not to spend A LOT of money. You are most welcome Liz.